If you are looking for a place where you can party by a pool, drink margaritas all day long, listen to the music so loud that walls seem to join you in the coolest and most outrageous party of the year, then you are in the right place. Surrounded by majestic mountains, Palm Springs, one of the nine cities in the great Coachella Valley, is widely known for the most extravagant pool parties in the region. It honestly does not come as a big surprise. With the temperature rising up to 110 degrees Fahrenheit in summer and lingering around 70-74 degrees Fahrenheit in winter, it is hard to think of any better pastime to escape the excruciating heat. Put on your swimming attire, get down to the pool, socialize, flirt if it is your cup of tea, drink, eat, repeat… What a life! But is this lifestyle suitable for everybody? Introvert by nature, I have never had a high regard for overcrowded spaces and events. Something about these big, loud social gatherings makes me uncomfortable, and, like a little snail finds security inside its shelf-house, I tend to retreat to the less crowded places. So what can you do then to escape the desert heat in this beautiful, tidy city with most stunning houses, gorgeous hotels, alluring restaurants and cafés, a city that seems to breathe with glamour and luxury? Find an alternative way to enjoy the place and yourself! And so we did. We found not one, but three ways to explore the city without getting roasted in its hot weather. Upon our arrival to the city, instead of diving straight into its luxe life, we heading out to a forest. The forest in the desert? Absolutely! 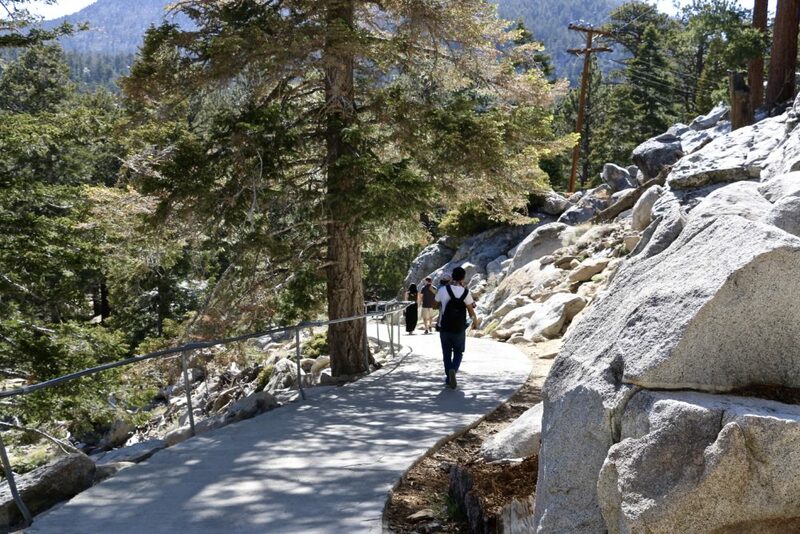 Open for both day hikers and campers, Mount San Jacinto State Park entices all visitors wishing to get a break from the scorching desert sun. 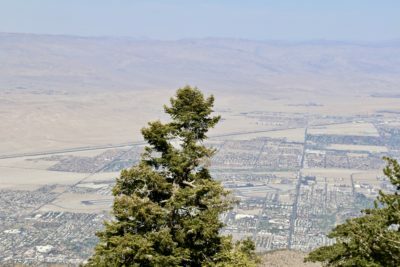 The temperature high in the mountains is approximately 20 to 25 degrees lower than in the downtown Palm Springs. Getting to the park is a simple matter of preferences. You can make a slight detour and drive a little bit over an hour before you enter the heart of the wilderness. 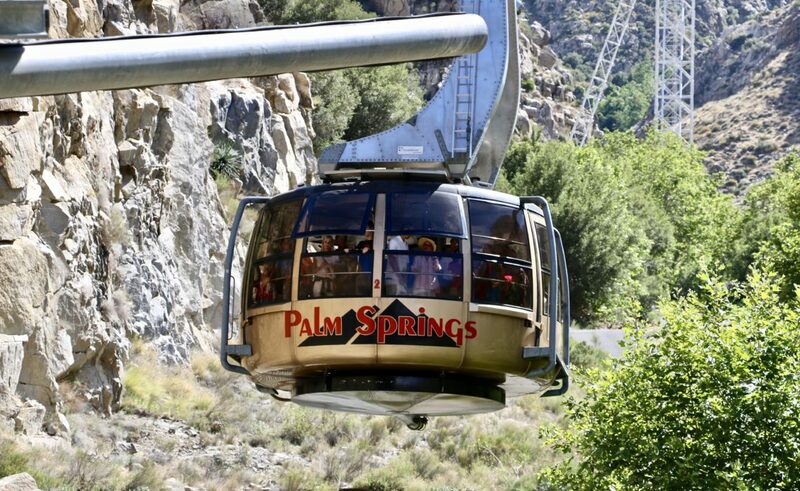 Or you can adhere to the Palm Springs Aerial Tramway, the world’s largest rotating tram car. Transporting up to 80 people at once, the tram starts its 10 minutes journey in Chino Canyon and takes its passengers to the Mountain Station situated at the elevation of 8,516 feet. 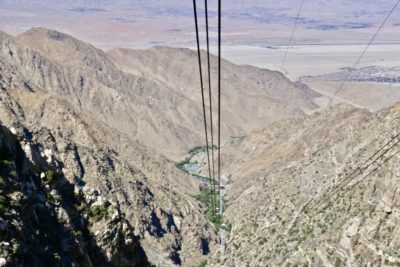 While ascending, the rotating floor of the tram car provides the travelers with an excellent opportunity to admire the breathtaking vistas of Chino Canyon. Every second of the 2.5 miles-ride, the striking mountains with steep cliffs and sporadic patches of dense vegetation marvel and entertain their soon-to-arrive guests. According to one of the tramcar employees (who kept a relaxed and pleasant environment inside by continuously narrating about the history of the tramway, discussing some contemporary issues, and warning about occasional bumps along the way), the Whitewater River, a small permanent stream in western Riverside Country, keeps the area well moist and thus provides suitable conditions for that lush greenery. At the top, the breathtaking views captivate you anew. In front of you, the forest with strong, tall pine trees that try to reach the sky extends as far as you can see. Behind you, the vast desert hold on tightly to its precious domain. You can restrict your visit to staying at the Mountain Station, soaking up the sun and rejoicing your eyes with the awe-striking views, stopping by at natural history museum and watching documentaries at one of two theaters, grabbing a bite at a restaurant and acquiring souvenirs at a gift shop. Or, if you are like me and many other visitors looking for an adventure accompanied with healthy dose of exercises, venture to the forest. Hiking in the wilderness and breathing the fresh air will do a trick to your body and mind, making you feel refreshed and renewed. 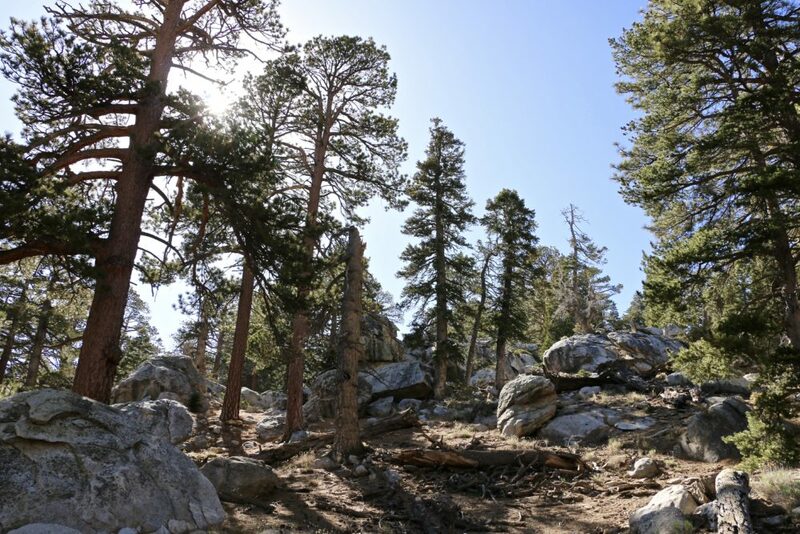 The hiking trails are suitable for all activity levels. The paved, gradually descending pathways make for a nice stroll. No need for running shoes or sport attire. You feel like walking on a sidewalk minus noise and exhaust gases from passing cars. Craving a more intense workout? 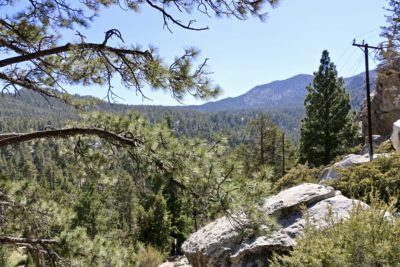 Then get off the paved path, anywhere you want, and build your own trail occasionally stopping to watch wildlife, collect pinecones, and have a little picnic in the shadow of the trees. Altering world-famous Audrey Hepburn’s saying, I have to admit, Spa is always a good idea, especially when the arrow on the thermometer goes up past 100 degree mark. 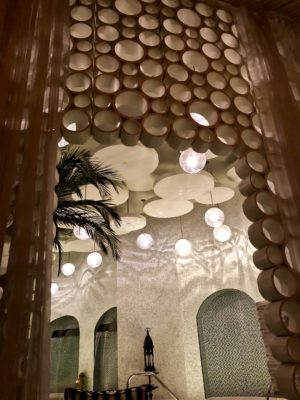 Behind the closed doors, the spa room (I adhered to Azure Spa and Salon at Riviera Palm Springs) with its calming ambience transports you into the world of relaxation and tranquility. We all occasionally need to rest, refocus, and rejuvenate. In essence, this is what the spa is for. Choose one of the dozens spas of Palm Springs and dive into the realm of health and wellness. Take advantage of all possible treatments. Do not forget to visit public lounges, where in the dim light you can swim in small swimming pools, relax in bubbling Jacuzzi, or enjoy company of your dear friends in secluded areas of the room while helping yourself with tea and fruits from the lounge. 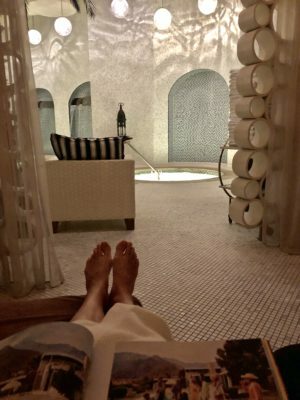 Your heart will be delighted and your body will not thank you enough for such a pleasant way to escape the Palm Springs’ heat. 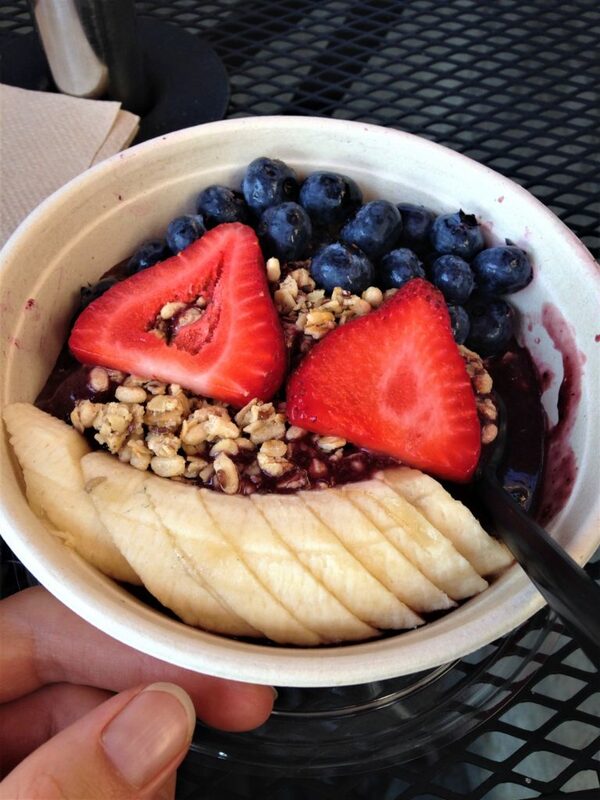 Acai Bowls for breakfast, lunch, and dinner. This is exactly what I did or almost did… Since the breakfast acai bowl was taking forever to arrive at my table, I had to skip it and run to my spa appointment on an empty stomach. The acai bowls or, let us be more flexible here, any fruit bowls and fresh-pressed juices are cure-all for beating the unbearable heat. Luckily, Palm Springs does not suffer from shortage of the places serving the acai bowls. Your choices here are if not endless than pretty broad. Fresh Juice Bar, Fruit Wonders, Bowl of Heaven, Juice It Up, Juicy Juicy are just some of the spots that you might want to visit to get your super delicious, super nutritious tropical bowls. And guess what? They are bomb! 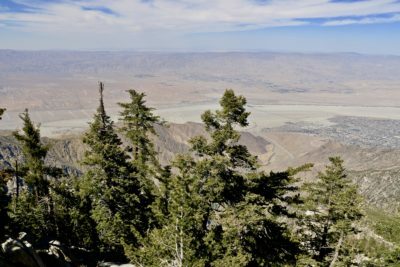 With these tree easy ways to avoid the overpowering heat, the visit to Palm Springs can turn into a sheer escapade filled with memories that will last for years to come. So say farewell to the blistering heat of the desert and enjoy your stay!